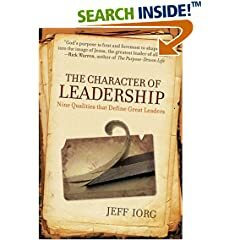 Recently I was given a copy of "The Character of Leadership" by Dr. Jeff Iorg who is President of Golden Gate Baptist Theological Seminary. Dr. Iorg used to be a pastor here in St. Joseph and a few of our families at Frederick remain to be good friends with him. He also stands as one of those in Southern Baptist leadership that I highly respect. One of our men who stay in contact with Dr. Iorg brought me a copy of the book. I read half the book on the flight to Atlanta and the other half on the way back and to say that I was convicted would be an understatement. In the book Dr. Iorg offers to us 9 characteristics of leadership that are concise, yet incredibly practical. I was excited about the instant application that was made obvious to me as I read through the chapters. In fact, as I finished the book I was able to sit down and write out 14 resolutions that I believe God impressed on my heart as a result of reading this book. Each of the chapters are strong, but the chapters dealing with Developing Servanthood, Gaining Wisdom, Showing Courage and Sustaining Passion were particular favorites. If you have not yet purchased this book, I would highly encourage you to pick up a copy. You can do so by clicking here. This book gets 4 out of 5 thumbs up!